The Toyota Camry has always been a favorite family sedan, with its unmatched ride quality and comfortable interiors. No matter how busy or hectic your daily life is, a Toyota Camry can make life easier for you by providing incredible performance and exceptional value. 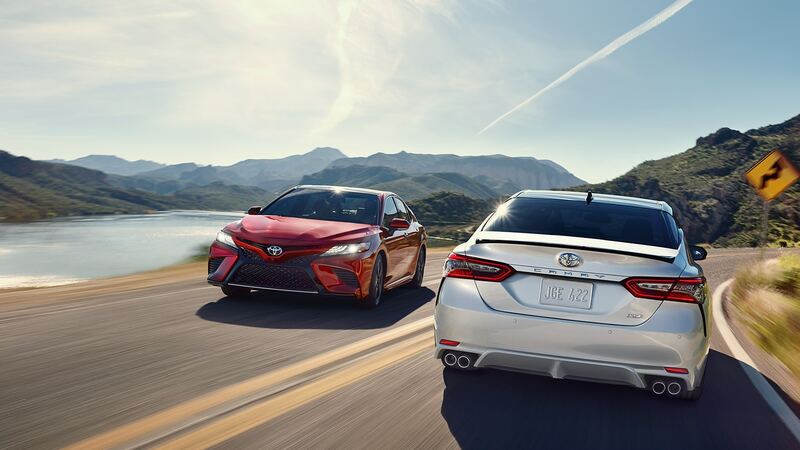 The new 2018 Toyota Camry is back with all of its signature features, along with some new additions. If anything, then the Camry has only become better and more efficient after the upgrades. Every customer looks for safety when purchasing a car. In that case, the Camry comes loaded with a host of safety features, both for the driver and the passengers. These include lane departure alert with steering assist, adaptive cruise control, automatic high beams, forward collision mitigation with pedestrian detection and automatic braking, and a rearview camera. On another note, the Camry has got another upgrade. For years, the Toyota Camry had been boring and predictable where looks are concerned. With the new model, it has entered the league of cool cars with its sheet metal build. It looks sturdy, attractive, and sleek, and definitely aims to be more memorable than its predecessors. If you have a family, you know the importance of saving every penny that you possibly can. The Camry delivers brilliantly when it comes to fuel efficiency, and provides excellent value for money if you are looking to save on gas. Aside from that, in-car entertainment also scores big in the Camry. With a smart, easy-to-use, responsive infotainment system, you can bid goodbye to slow response time and endless frustration. The sleek new system is quick and efficient and makes this family car a treat to drive. Some of the features include digital radio, music player, Bluetooth audio, and ten premium speakers. If reliability is your priority, then the Camry gives a stellar performance on that front. Toyota has a legacy of reliability, and over the years has ranked in the top for its valuable service. The Camry surpasses all other midsize sedans when it comes to reliable service. If dependable service is a must for you, the 2018 Toyota Camry should be your choice. The only big drawback of the new Camry is the lack of smartphone integration. But overall, the car scores full marks for being a high-performance, mid-size sedan. Let New York Autobrokers serving the Smithtown and Brooklyn, NY area use their 20 years of experience to get you the best lease payments or price on any car make or model of your choice. Call us at 631-446-4455 for more information!